"He's the guy you want to get off the bus first." - Coach Bobo talking about fullback Quayvon Hicks. Hicks, a sophomore from Pierce County, is turning a few heads this spring. And it's not just because the depth chart at his position is a lot narrower. 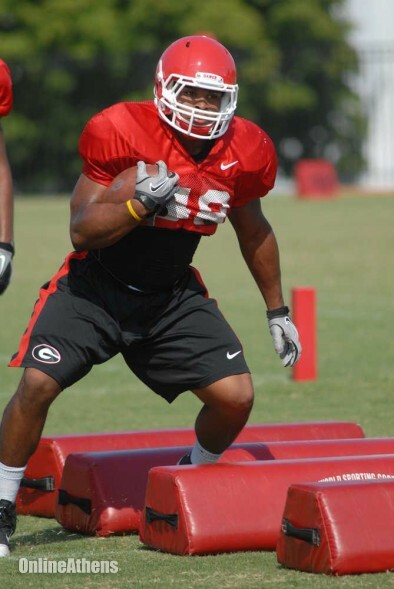 Merritt Hall is nursing an injury and Zander Ogletree is not in Athens any longer. All that being said, what makes you a little nervous about that last sentence may also convince you to get the pitcher of kool-aid out of the fridge. As consistent as Hall proved to be in run and pass blocking last season before an ankle injury sidelined him against Florida, Hicks has an extra few inches and 30+ more pounds. Richt talked about Hicks in the context of how there was less separation between the starters and backups at many spots. “I don’t want to brag too much about him, but he’s really starting to look like he could become a heck of a fullback,” Richt said. Reminds me of how much Richt gushed over LSU fullback JC Copeland before the 2011 SEC Championship game. The key for Hicks has always been picking up the scheme so that he can help his large frame pick up the blitz and get in the way of would be tacklers. Physically, he walked onto campus ready to go. Now it sounds like his mind is in the right place when the opportunity has come knocking. Look for him to knock a few of Grantham's boys around this Saturday.